This is nice example of original serving of table for holiday meal. When you are waiting for Christmas it is real pleasure to make such pretty things to surprise your relatives and friends who will visit you. 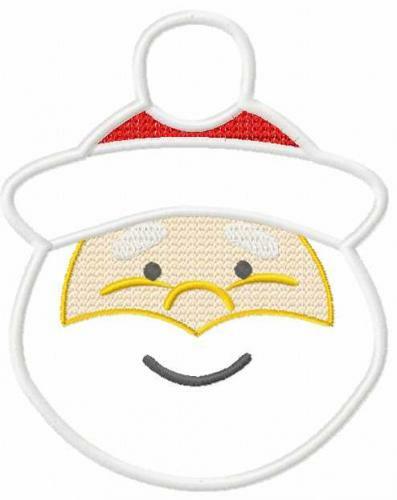 Using Santa Claus free embroidery design 10 you may create truly original and interesting accessories which will be remembered for a long time. 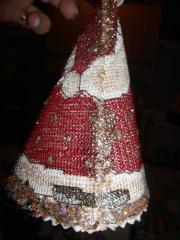 For example here you see napkin holders with face of Santa. 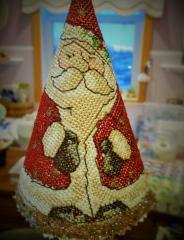 Author: Bernice Campbell Author comment: "Here is a pic of one of your freebies....thanks so much"
This soft terry towel is collective gift for good grandfather from his grandchildren and little great grandchild made by Kreativnaya Shtuchka. Sure he will be happy to get this pleasant and practical present with warm inscription. 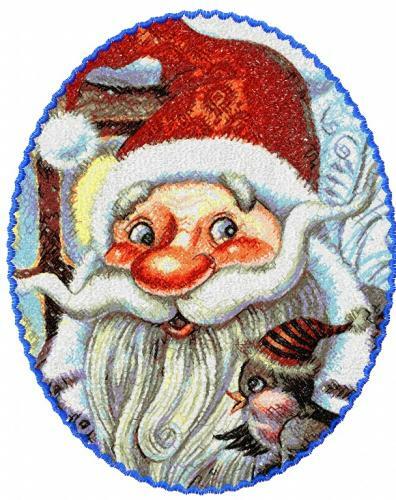 It is added by Santa near chimney embroidery design 2. 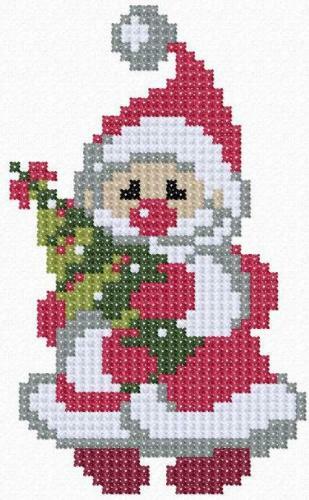 Maybe this granddad looks a little like Santa Claus. It seems all grandchildren in world think so about their grandfathers. Here we see two ready handmade gifts packed in transparent wrap. Both of them are executed from practical dark fabric shown behind. They are decorated with two different samples from same series. Left one is Dwarves machine embroidery design and right one is Dwarf machine embroidery design. 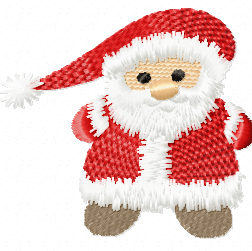 Gnomes are not Santa but they also able to create merry holiday mood for you! 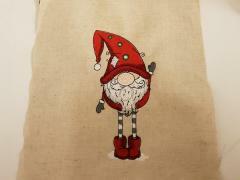 This is nice embroidered terry towel which is definitely prepared by its author as Christmas gift for her friend. 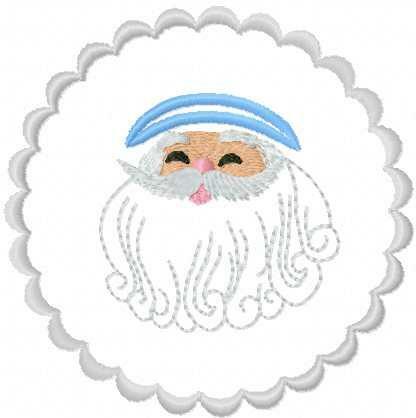 It is clear because of usage Gnome in phrygian cap with hearts holding lantern embroidery design. This interesting sample is not as traditional as Santa Claus or Christmas tree. 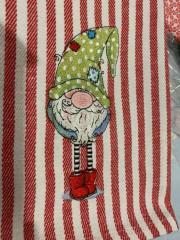 But funny figure of dwarf in big cap truly can create merry holiday mood. 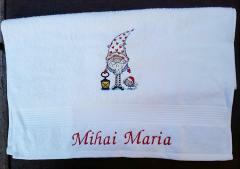 Here you can see good example of Christmas machine embroidery designs on towel. 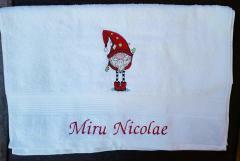 This is simple terry one which became original and unique work piece due to Gnome in red phrygian cap and boots embroidery design. It is added by its owner’s name. Now it is very good holiday gift which is not just useful accessory but also expression of warm feelings of its. 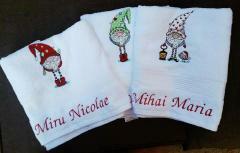 These is holiday set which includes three pleasant terry towels embellished with Christmas designs. 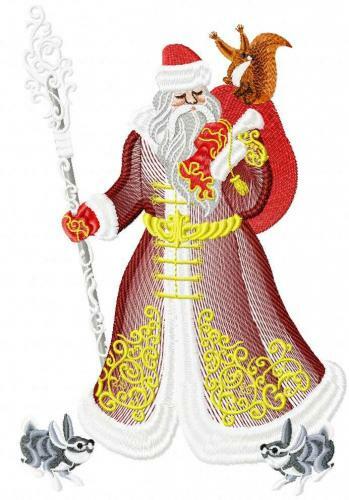 Left one is decorated with Gnome in red phrygian cap and boots embroidery design, one in middle – by Gnome in polka dot phrygian cap and boots embroidery design and one in right – by Gnome in phrygian cap with hearts holding lantern embroidery design. Together they are good handmade gift for Christmas and New Year.